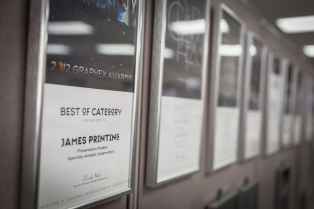 Although we’re not one to boast or brag, James Printing Company is extremely proud of the things we’ve been able to accomplish in our 40-year history. Being known for our quality of work and level of customer service, in combination with maintaining long-standing relationships with hundreds of clients throughout the Kansas City area, is truly our greatest achievement. We’re also pleased to hear customers who visit our facility comment on it being ultra-clean and modern and standing out from other printing facilities they may have visited. We pride ourselves on finding ways to invest in our employees and the technology that keeps us on the forefront of printing techniques while upholding our dedication to craftsmanship. Throughout the years, we’ve also won awards that serve as a testament to the quality of printing we continuously pride, such as the Best of Kansas City award presented by the Printing Industries of America (PIA). But ultimately, we value your business and consider your feedback and referrals as the biggest honor we could receive. Don’t just take our word for it. See what some of our fantastic clients have to say about James Printing. 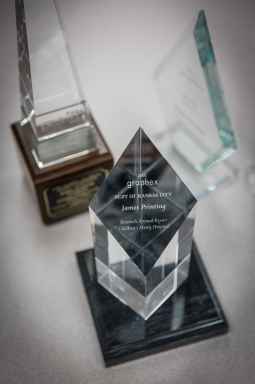 Please Contact Us if you have any questions about the awards we've won or the testimonials we've earned. Or, if you have any other questions about the printing, marketing or the communication services we provide, we're happy to help in any way we can.